Last Tuesday the Anchorage Assembly voted 9-2 to ban the use of plastic bags by retailers, making Anchorage the 23rd community in the state of Alaska to take practical action in protecting our environment and keeping our cities clean. The ban will be effective this upcoming March. Alternative paper bags will be available at checkout for 10-50 cents each. Personally, I recommend purchasing re-usable bags to be extra environmentally friendly and save some money. You can usually find some available for purchase in the big chain grocery stores for one to two dollars. Last session, I introduced HB 264, which proposed a statewide ban of disposable plastic bags. The bill did not pass into law, however, I worked hard to bring a practical solution to the issue of plastic contaminants to the table. Alaska is often referred to as “the Last Frontier”. Its beauty is indescribable. In a state where tourism is one of our biggest industries, we need to act to protect our environment and the industry alike. I am proud of our local Assembly members for passing this ordinance and taking positive steps for a better Anchorage. Next Tuesday, September 11th, Representative Matt Claman and the UAA Justice Center will host an Alaska State Forum on Public Safety. The event takes place from 1:00pm-5:00pm at the Wendy Williamson Auditorium on the UAA campus. Registration is required, but attendance is free. Either my staff or I will be personally be attending, so we will see you there. To register and for more information click here. Summer may be coming to a close, but there is still plenty of daylight and lots of fish to catch. 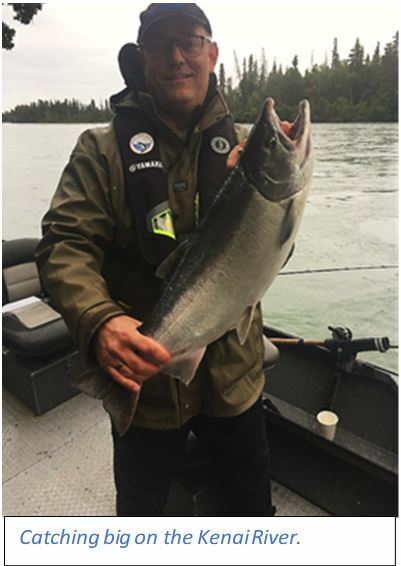 The Kenai was re-opened for sockeyes August 23rd if you want to catch the tail-end of the run, although the numbers for the Russian are looking more promising. It’s also peak season for silvers, trout, and Dolly Vardens. Before you head out, check the Alaska Department of Fish and Game’s website for plenty of information about fish counts, daily/yearly limits, and regulations. You can subscribe to email notifications from ADF&G here to receive timely updates about changes in regulations for sport fishing across the state. Make sure to get out there and take full advantage of summer’s end. It has been a busy summer, but I am always happy to hear from you. Feel free to email, write, or call me anytime with questions and concerns. As your state Representative, I’m happy to be of assistance.